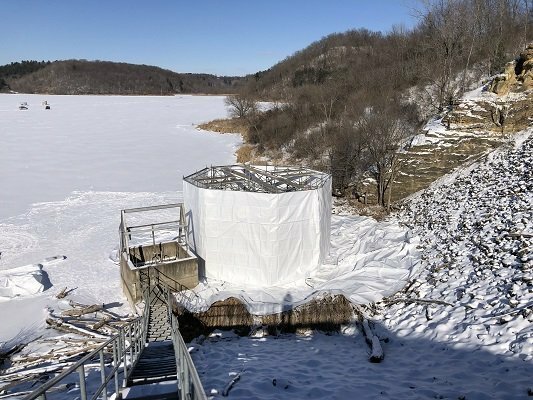 Despite the recent polar vortex in the Midwest with subzero wind chills, TMI Coatings, Inc. (TMI) continues its’ work refurbishing the Eau Galle Dam outlet and morning glory structure near Spring Valley, Wisconsin. The work involves paint removal and repainting the interior of a 9ft diameter 300ft steel horseshoe shaped conduit and the steel structure of the morning glory. The system works as a large drain for the Eau Galle Reservoir with water flowing through the morning glory structure and flowing downstream of the dam. In efforts for painting operations to begin and maintain essential river habitat, the United States Army Corps of Engineers or USACE had to lower the reservoir level below the crest of the morning glory by bypassing the flow through adjacent sluice gates. However, since the conduit is the only flow path downstream, TMI had to install temporary piping in the conduit to keep river flow active while keeping the conduit dry for painting. This was a dauntingly large challenge as the water flows at a constant rate of 23 cubic feet per second with the occasional push for more. On December 28, 2018, due to expected events, the reservoir level increased and breached the morning glory structure. Water flushed through the conduit into our work zone. The flow displaced our temporary piping and damaged our scaffold stair tower installed inside the spillway. 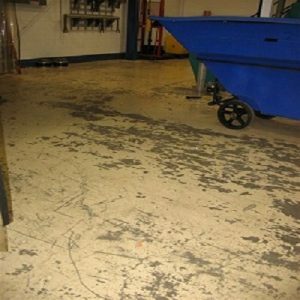 As the flow dissipated, TMI had to retrieve the dislodged piping and scaffold, re-install piping, and replace and reset other damaged materials. 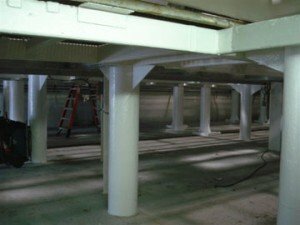 After re-installation of the 36-inch diameter by 600 feet long temporary piping, TMI fully enclosed the work zone for abrasive blasting and painting including installing heat and ducting to maintain temperatures above 35F. Containment and access to the morning glory structure is where another challenge was introduced. The morning glory is a 26ft diameter 10ft tall concrete structure with steel grates and is stationed directly in the water with no land access. TMI placed structure scaffolding around the morning glory for complete containment. 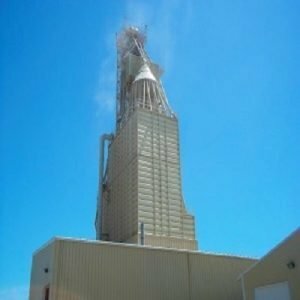 Our scope of work includes abrasive blasting and relining both structures and performing a survey of the current steel conditions. The new paint system to be applied is a zinc vinyl system in the conduit and zinc aluminum on the morning glory grates. Beyond or apart from working around the active river flow, the job site has its’ fair share of obstacles relating to difficult access, confined space, lead abatement, and drastically or extremely cold temperatures. Our team has incorporated several safe and effective solutions to work around such obstacles and continues to move the project forward.